Technology is amazing. Goods and services can be delivered to our doorstep with the click of a button, and we carry this power with us wherever we go in our pockets. Everything is online these days. This is a blessing in many ways, but it can also be tricky. People want to see and feel the products and experience them in person before making a decision. With fabric, it can be hard to tell the actual size of fabric patterns based on an image on a screen. There’s an important term in the details section called “repeat” that solves this issue. Any fabric pattern has a specific size, which repeats over and over across the fabric. The “repeat” is how many inches the pattern is before it starts over again. Repeat is measured both horizontally and vertically. 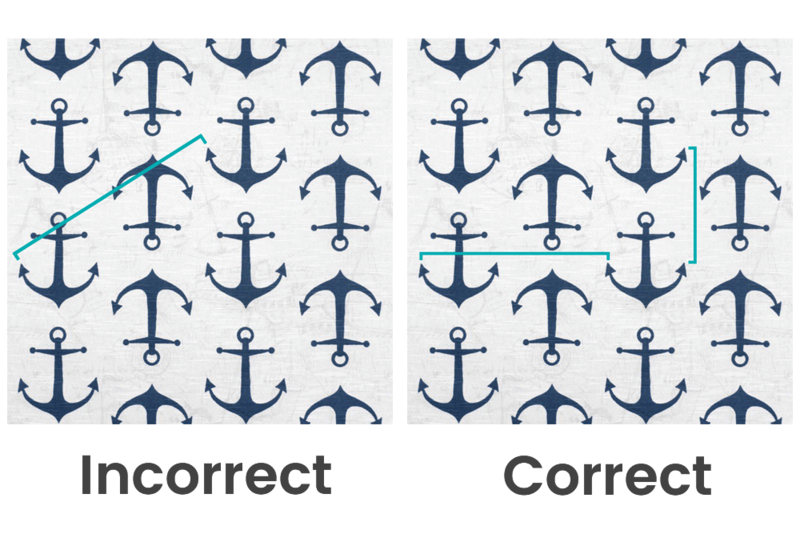 To measure repeat, start by choosing a spot on the pattern. What spot you use exactly doesn’t really matter, but it should be small and easy to recognize. For the below example I used the tip of the left arrow of a downward facing anchor. Measure to either the left or right of this spot until you come across the next appearance of this point. Make sure it’s the SAME point, not a SIMILAR point. Many fabrics have similar objects in their patterns. You’ll want to use measuring tape or yardstick instead of a ruler since the repeat is often larger than 1 foot. It’s important that you measure directly to the left or right, don’t move the measuring tape up or down at all. The distance between these point is the horizontal repeat. Do this again to find the vertical repeat. Remember, measure directly up or down to find the next point. You don’t need to use the exact same point that you used to find horizontal repeat. Sometimes the vertical repeat can be much larger, so it’s easier to choose a middle spot for horizontal repeat and a lower/higher spot for vertical repeat. We list the pattern repeats for our fabrics, so you can use these measurements to get a sense of the scale of the pattern. 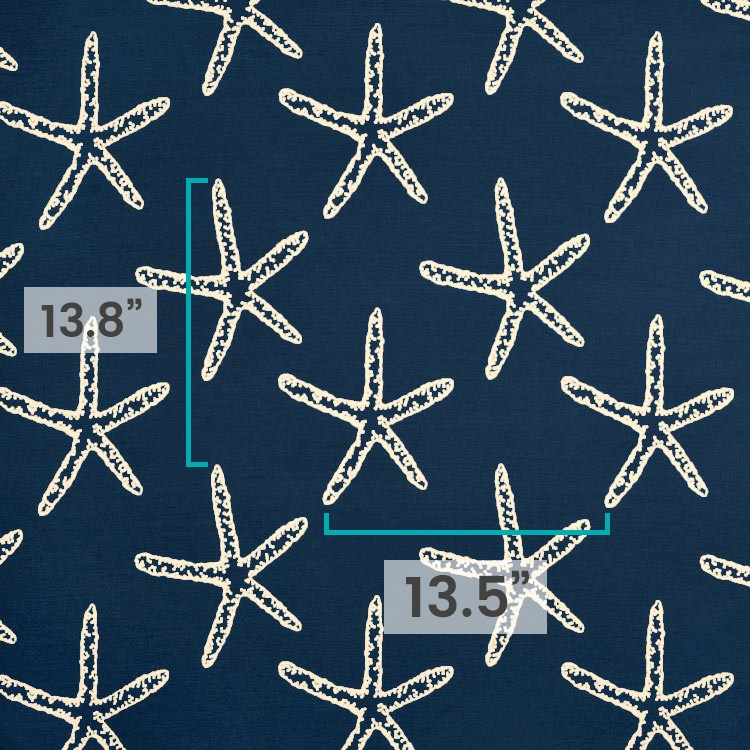 You can also use these measurements to determine the size of objects in a fabric pattern. For the above fabric, the horizontal repeat is about 13 inches and the vertical repeat is about 8 inches. The anchor appears to be a little under half the horizontal repeat, and a little shorter than the vertical repeat, so we can make a ball park estimate that the anchor is about 5 inches wide and about 7 inches tall. Another factor to take into consideration is the relativity of scale in fabric images. Let’s compare the horizontal repeat of the above example with a different fabric. At first glance, it appears that the horizontal repeat of the fabric on the right is about 50% bigger than that of the fabric on the left. We know that the fabric on the left has a horizontal repeat of about 13 inches, so we can estimate that the repeat on the right side fabric is about 20 inches. It’s actually 27 inches, twice the repeat of the one on the left. The reason is that the scale is different. For larger patterns, the images are scaled down a little so you get an idea of what the full pattern looks like. If the fabric on the right used the same scale as that of the left, you wouldn’t even see a full repeat of the pattern. Even as it is now, you can’t see a full vertical repeat, which is 36 inches. This is important to keep in mind when shopping online for fabric. 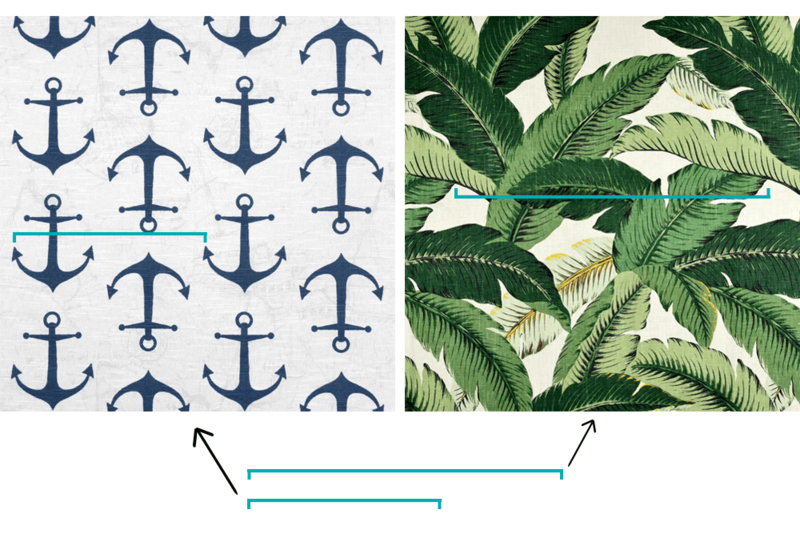 If you compare fabric images that look like their patterns are a similar size, it could be far off. Make sure to take repeats and scale into consideration when choosing your fabric. Another factor to consider, especially with larger projects like upholstery, is if the pattern is railroaded. If you unroll a roll of fabric from top to bottom, the pattern is normally vertical to you. 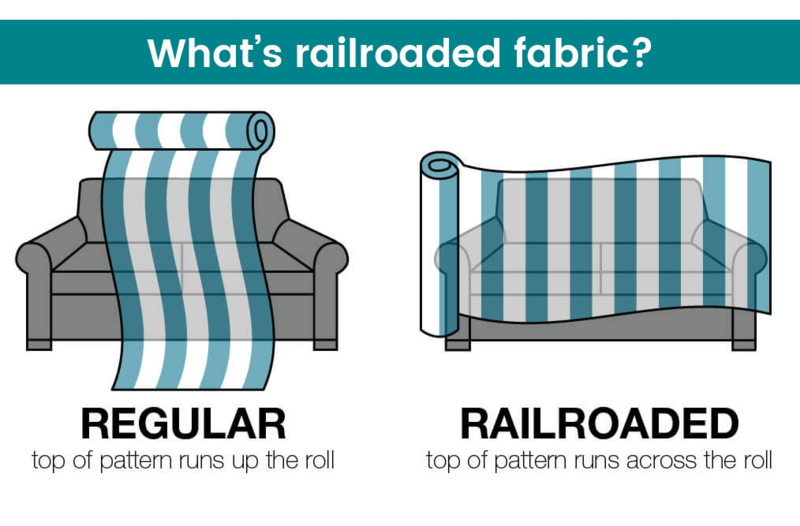 If you unroll it from top to bottom and the pattern runs horizontal to you, that means it’s railroaded. Fabrics that are railroaded will be noted in the details. These are important things to consider when planning any project. Whether it’s for a tablecloth, couch upholstery, or window treatments, knowing about pattern repeat is essential. Check out our selection of Tropical and Beach fabric.